As a Vegan since 1994, I know what works in a busy vegan kitchen. 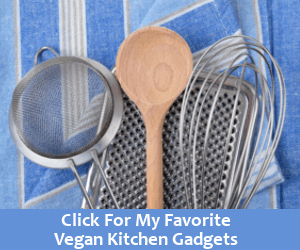 Below you'll find links to purchase essential kitchen tools including small electrics, kitchen bowls and gadgets, and more! These are the tools I use in my everyday vegan life. Thanks for stopping by, and if you have any questions please feel free to ask it below or shoot me a note through my Contact Form. First and foremost, there are some main kitchen tools I use nearly every day. There are a couple different options when it comes to a steamer. Some are electric steamers that sit on your countertop -- you set the timer and walk away. We'll talk about these in a moment. Others are in-pot steamers and they're just like they sound. They sit in a pot on your stovetop filled with vegetables and covered with a lid. The water in the pot boils and steams the veggies inside. These are more hands-on. They are also less expensive than an electric steamer. The only downside is they really ONLY steam vegetables. We'll get into more options further down the page. If you want to go the route of the in-pot steamer, then I recommend a few different in-pot steamers for you. This is about as low-tech as you can get. They've been around forever and there's a reason many kitchens have one. Because they're inexpensive, easy, and they work. Now, see that little thingy sticking out of the middle? That's what you hang onto when it's time to pull your veggies out of the pot. It will, of course, be hot and steamy so you'll need a hot mitt. But hey, it's only around 5 bucks so we really can't complain. This little steamer will lay flatter to fill a large pot, but it will also collapse a bit when you place it into a smaller pot. Next, we have a non-stainless non-plastic little number made by OXO that does the same thing. It's larger, and it's made out of silicone which I have fallen quite in love with because it never gets too hot to touch. As you can see, it has nice big side handles that work beautifully to pick your veggies up and out of the pot. Now, these particular steamers won't fit in smaller pots and must be used in medium-size pots or larger. As I mentioned, it's made of silicone so it won't scratch anything (especially worth noting if your pots are lined with Teflon or some other non-stick coating that you don't want scratched). It works exactly like the steamer above for steaming veggies. Easy peasy. Because of the design, though, you can do more with it. 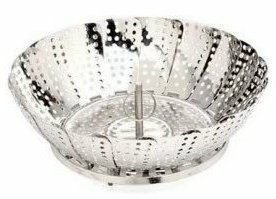 You'll notice there is no center stem which means this can also be used for steaming lentils, small legumes, and whole grains by simply adding water to the pot, then placing the food and some water in a heat-proof bowl, setting the bowl in the steamer, and covering the whole shebang with a lid. Unlike an electric steamer which we'll cover soon, you can't walk away from the boiling pot -- and it will need to be watched carefully to ensure the water in the pot doesn't boil away, adding more as needed until the food is tender. This can take anywhere from 20 to 60 minutes. Clearly, not an ideal situation, but if money is super tight you lose a little of the convenience factor. Such is life! It costs just a tad bit more that the first in-pot steamer, but it still won't break the bank. Click here to order. If you're up for spending just a little more, then check out this graduated stainless-steel insert. It has handles. It has graduated ridges on the bottom so it can fit many different sizes of pots. And it comes with its own shatter-resistant glass lid -- which makes sense since it might end up sticking entirely out of the pot altogether. For steaming veggies as well as other foods like lentils and other small legumes as well as whole grains, consider an electric steamer. Sure they cost a little more, but they are super convenient and perfect for those with super busy lives. That's because they work in the background while you do other things. So you can just set it and walk away until the timer goes off. 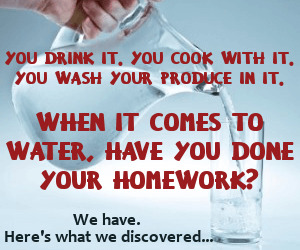 Many have multiple levels that allow you to cook various foods at the same time. There are MANY electric steamers to choose from out there. They're really all pretty much the same. Some are more expensive than others, some might be more well made or have more bells and whistles. But one thing they nearly ALL have in common is that they're made of plastic. I love this steamer because it has multiple levels so you can cook more than one thing at a time. For instance, you can have a batch of grains cooking and then just before they're done, add the next layer to steam some veggies. Or steam grains and lentils at the same time. Or veggies and small legumes. You get the picture. I was a little resistant at first to using a 3-in-1 cooker, which means that it was made to do more than one thing. In this case, and the one I own and recommend, is a steamer, a pressure cooker, and a slow cooker all rolled into one. So why was I resistant? But since Jeff took a liking to a 3-in-1 cooker, we forged ahead. And I am now 100% impressed. If you can afford one, I recommend you get yourself a 3-in-1-cooker. It makes your life so much easier in the kitchen because you can do so much with it. It takes convenience to a whole new level. I call it a 3-in-1, but they call it a 7-in-1 but that's because they list "soup making" as one of the options which I would simply call pressure cooking or slow cooking. They also list rice cooking as one of the options, which I would simply call pressure cooking or steaming. So, in my world, it's a 3-in-1. 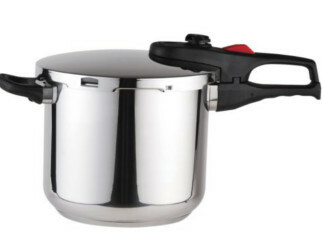 The inner pot is made of beautiful 18/10 stainless. I really like that this company works so hard to get stainless steel products out on the market for those of us who don't want to use plastic (or Teflon) like we used to. So I like voting with my dollars! So you pay one price for one small appliance and you can do SOOOOO much with it. We use it not only to steam veggies and steam delicate grains and small legumes, but to pressure cook beans and some grains, and slow cook soups and stews. Awesome investment. I think you'll really love it too. Highly recommended. 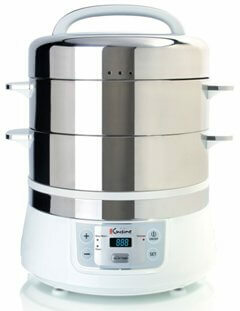 Pressure cooking is more convenient and much faster than any other cooking method out there. If you can afford it, a pressure cooker is a MUST for busy people. In fact, this is such an important topic I have created a 3-part article all about it where you'll learn WHY pressure cookers are used, which foods should and should not be pressure cooked, how to cook with an electric cooker OR a stove top cooker, you'll learn how to decode those kooky pressure cooking recipe directions too. I have already covered the electric pressure cooker I use and recommend in our Steamers section above. In case you missed it, simply scroll up. Electric pressure cookers are very easy to use making them fantastic for beginners to pressure cooking. You literally just set the timer and forget about it until the timer goes off. Click here to learn more about this 3-in-1 electric pressure cooker we recommend. Before I began my electric pressure cooker adventure I used my trusty stovetop cookers. If you're a little old school and you want to continue on with a stovetop cooker, then I recommend this one from Magefesa . Before my electric cooker days I used and recommended Magefesa stovetop cookers -- they're like an old friend to me. They are still as well made and dependable as they've always been. Stovetop cookers are a good idea. You can use them on gas stove tops even if your electricity goes out. I have even heard of people using them over a camp fire. So it's really a good tool to have in case of emergencies -- as well as for everyday use, of course. Again, I have used and recommended stovetop cookers by Magefesa for years. Their cookers are excellent -- very well made, dependable, and last for years and years. Jeff and I purchased our Vitamix back in 1997. I can't express how much I love this machine. It has made an amazingly huge difference to our lives! So worth the money -- you'll use it multiple times a day every day to make smoothies, sauces, soups, to grind grains, and so much more. Most vegan kitchens have a high-powered blender these days. You'll be happy you have it. Every once in a while someone asks us what we use to grind our grains. If you don't have a Vitamix or other grinder that would work for this purpose than I highly recommend this good ol' fashioned grain mill ! It rocks. 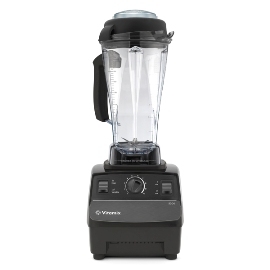 We have a Vitamix and we STILL like to use this to grind our grains, especially for porridge. It seriously makes the food taste better! 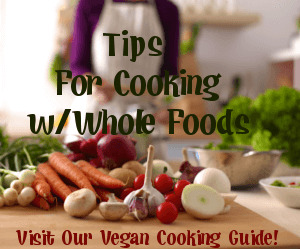 The truth is that SOME vegan foods require a non-stick surface (especially if you avoid oil). Period. Exclamation point! Here's what I, personally, use in my own kitchen and have for years now and they all look great with very little wear and tear. 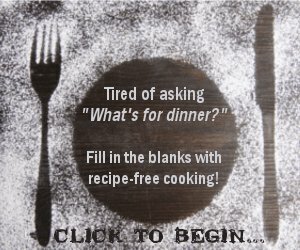 Why non-stick? Because you never need to use oil and your food will fairly float off the surface. It's quite magical. I have one extra-special non-stick pan that I make ANY high-protein foods like scrambled tofu or pancakes. High-protein foods are notorious for sticking to the pan. Attempting these foods in any other type of pan other than a non-stick will cause you to pull all of your hair out of your head! Some people shy away from non-stick pans because of the fear the non-stick surface will chip away and end up in their food. That is a very important concern, of course. But not all non-sticks are created equal! I just replaced my current non-stick after 3 years. It was juuuust starting to show some signs of wear. It wasn't chipping AT ALL, it's just that it began to lose it's non-stickability (is that a word?). These extra-special pans are not the same as every other non-stick pan out there, by the way. 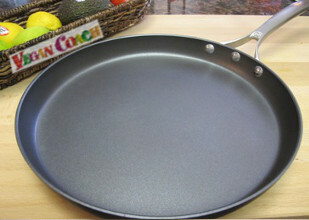 They're made by a process called anodization which creates a surface that heats up evenly and quickly, is sturdy like steel, handles extremely high temps, is easy to clean, and easy to cook with (unlike other non-stick pans which are usually made of Teflon and I have heard can be quite dangerous to use, especially around birds). My trusty pan lasted longer than it maybe should have because I follow my own rules and don't use anything metallic in it, I never scrub it with stainless steel, and I never put it in the dishwasher (but then again, you really shouldn't put ANY pans in the dishwasher). 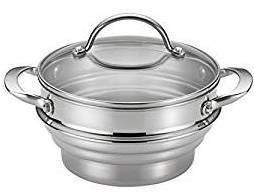 For all my other stovetop cooking needs, I use this amazingly efficient, professional, and long-lasting set of stainless-steel pots and pans. They can be used with gas, electric, or even induction cook tops - so no matter which kitchen your life leads you to over the years, your pans will be ready to go. As you might know, stainless steel is NOT an efficient heat conductor. But aluminum is a very good heat conductor. Of course, we don't want aluminum touching our food do we? Hell to the NO! So one common cookware structure is to have 2 stainless steel layers with the aluminum layer smushed between the two. The aluminum helps the pans achieve even heating while the stainless steel keeps the aluminum from touching the food. The thicker the aluminum layer, the easier it is to heat evenly. 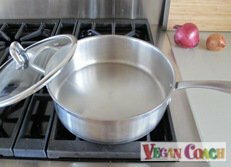 In these pots and pans, the bottom aluminum layer (surrounded by the stainless) is three times thicker than most pots/pans you'll find out there. This ensures even heating , even when using with an induction cook top which is known for creating hotspots. In addition, Whole Clad bonding is used for this process instead of an encapsulated base construction extending the life of the cookware. These pans have these thick layers on the bottom only, meaning the heat won't travel up the sides of the cookware. This is ideal if you don't care too much about heating the rim, which is true for majority of cooking tasks. I use and recommend Barkeeper's Friend to keep them sparkling. You simply cannot own stainless and not have a cleanser like this at your disposal. Now, let's move on to Part 2 where we'll cover more helpful tools for your kitchen including small gadgets and other fun items to make your life easier and lessen your learning curve. See you there! But before you go, please share below: Which are your favorite I-use-them-practically-every-day kitchen tools? 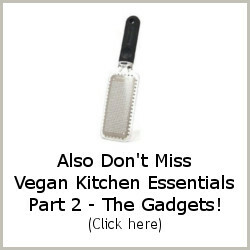 Please note: VeganCoach.com is a participant in the Amazon Services LLC Associates Program, an affiliate advertising program designed to provide a means for sites to earn advertising fees by advertising and linking to Amazon.com.